Any business is vulnerable to a natural disaster, be it a flood, hurricane, earthquake or wildfire. But an act of God can be especially disastrous in the cannabis industry, where business and property insurance can be hard to come by. The cannabis industry has seen several catastrophic events hit business owners the past two years, forcing them to rebuild their operations from the ground up. 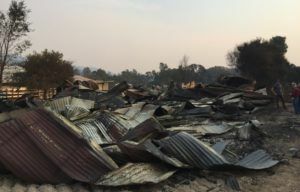 This year, the Camp Fire and Woolsey Fire are causing devastation in Northern and Southern California, respectively, though how the wildfires are impacting marijuana businesses is unclear at this time. In 2017, however, more deadly wildfires in California and the devastating impact of Hurricane Maria on the southeastern United States and the Caribbean were particularly damaging to cannabis companies. What can a cannabis business owner do to rebuild once a company has been ravaged by something beyond its control? Selecting materials that are are able to withstand damaging elements, including fire or wind. Constructing greenhouses that are lower and sturdier, making them less vulnerable to strong winds. Securing insurance that will replace the full cost of a lost crop, although options for such coverage may be limited. Preparing the surrounding land – dig fire breaks or thin trees, for example – to protect buildings against wildfires.